An exceptional painting by the world's foremost aviation artist remembering the most famous of all Luftwaffe Fighter Wings that fought on the Western Front during the early years of World War Two. 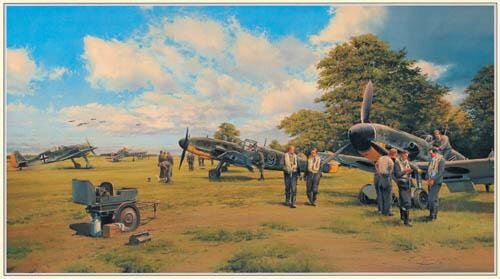 Prints are signed by Luftwaffe Aces who contested the great air battles with pilots of the RAF on the infamous Channel Front, 1940-1941 Badly mauled during the Battle of Britain, by early 1941 the Luftwaffe fighter wings, strung right across northern France, were back on strength. The front line squadrons were reequipping with the up-rated Me109F and, though suffering initial over-heating problems, the remarkable new Fw190A was making its first appearances. The Luftwaffe pilots were again full of confidence, and having the air endurance advantage of fighting close to their bases, they were competing on equal terms with the Spitfires and Hurricanes of RAF Fighter Command. Having spent the first 18 months of the war fighting a defensive air battle, RAF Fighter Command was raring to go onto the attack. The mix of Rhubarbs - two or three-plane, low-level incursions to attack enemy bases and installations - and large fighter sweeps aimed to entice the Luftwaffe up for a fight, kept the German fighter pilots busy throughout the summer. All through 1941 great air battles raged all along the Channel Front. Robert Taylor's comprehensive new work Eagles on the Channel Front, the fourth and final print in his widely acclaimed "Wings of the Luftwaffe" series, recreates a scene in northern France in the late autumn of 1941. Having just returned to their temporary airstrip in the region of St. Omer, Luftwaffe pilots of JG-26 excitedly debrief their recent encounter with Spitfires and Hurricanes, fought high over the Channel coast. The gleaming new Me109F's are discreetly parked under trees on the edge the airfield, providing some cover from low-level surprise attacks. While ground crews busily prepare the Wing's Me109s for another mission, a group of the exciting new Fw190A fighters taxi out. The scenario will continue right into winter. In his inimitable style, and with inordinate skill, Robert Taylor manages to evoke the heady atmosphere of a German front line airfield on the Channel Front in 1941. With the entire edition signed by Luftwaffe Aces who flew the great air battles of WWII, this wonderfully atmospheric image provides aviation art connoisseurs with a truly remarkable and valuable collector print. Overall Print Siaze 36" x 24"